Since I was quite free during office hours, I used the time to write a blog post, but of course, I got distracted as soon as my coworkers strolled into my office. It was all fun and games while we did some personality tests and discovered that I was the most extroverted out of all of us (which I was really surprised about). We then delved into some more somber topics such as how I should see a doctor about my horrible memory and my tendency to inadvertently distract others and be distracted. Afterward, it was time to make things more positive with a sushi adventure, but I had forgotten which restaurant I had wanted to go to and could not concentrate on searching for a restaurant online. Sigh... In the end, I just went to one of my favourites: Sushi S Japanese Restaurant. 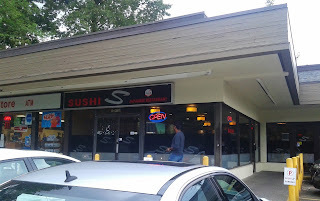 I first discovered and tried Sushi S in 2013, and it has long since been my favourite Japanese restaurant in South Burnaby. It is a Korean-operated restaurant that offers a convenient choice of sushi for BCIT students. Sushi S was once a little-known restaurant, but has now become very popular. The restaurant was completely full as I walked in on a Tuesday. Their menu featured some new additions, and in a bid to sample as many of those as possible, I ordered six dishes of food, which garnered many strange stares and curious looks from the chefs, the waitresses, and the tables sitting around me. It sure felt wonderful to be a professional attention whore. The Wild Sake Nigiri (sockeye salmon) came with a generous amount of salmon, though it didn't have the brightest of flavours. The Unagi Nigiri, on the other hand, was quite small and would benefit from a more smoky flavour as well as a slightly thinner sauce. The Inari Nigiri was the best of the three, with the bean curd exhibiting an appealing chewiness and the rice delectably seasoned. 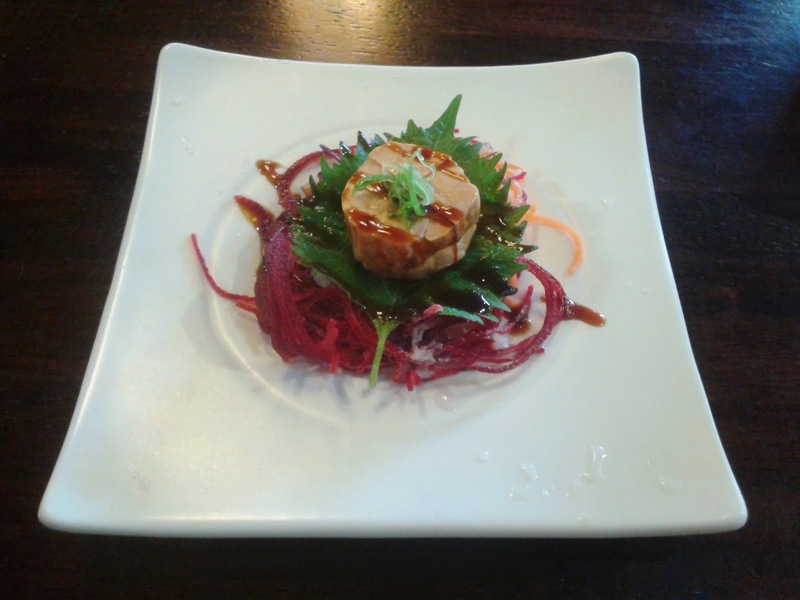 The Ankimo (monkfish liver) came with four small pieces for $4. 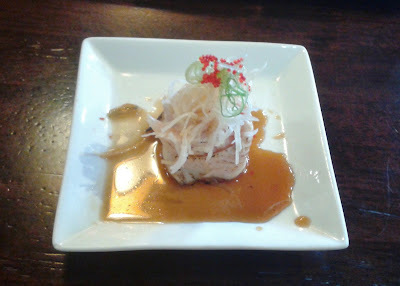 While it had a nice soft texture, I didn't really agree with the light teriyaki sauce dressing. Ponzu sauce is a much better dressing for this dish as it provides more moisture and a tangy flavour that complements the delicately sweet flavour of the ankimo itself. I apologize for possibly the crappiest picture on my blog thus far. The Seared Toro Nigiri was presented as an eye-catching mini tower, but the toro (tuna belly) was slightly overdone, so it felt cooked rather than seared. However, the light ponzu-soy sauce combo helped livened up the flavours. 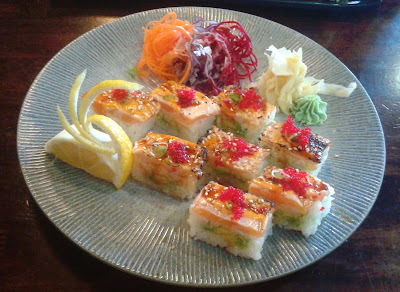 Onto my favourite Japanese fusion dish, the Aburi Salmon Oshi here featured Atlantic salmon and avocado. Unlike Japanese Bistro Hatzu's version, which made me cry, this one featured the right amount of spiciness (in my opinion). The Atlantic salmon on top was soft and exhibited a hint of smoky flavour. The avocado brought a creamy feel to the oshi, but it did make the sushi rice seem slightly drier than it was supposed to be. 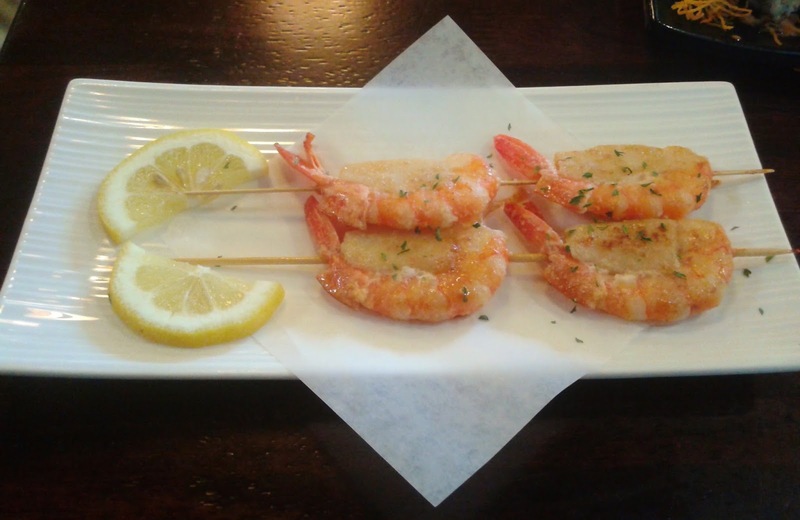 The Kushiyaki consisted of skewered, grilled prawn, scallop, and butter garlic sauce. I liked how they used a sprinkle of herbs to spice up the flavours with this dish, and the prawns had a nice buttery flavour. However, the skewers were slightly overdone, so the scallops ended up tougher and chewier than expected. For my special roll, I went with the roll that matches my personality the best—the Awesome Roll. I mean, what is more awesome than a forgetful, distracted attention whore who has a love relationship with one very specific type of food? This roll came with baked salmon and yam tempura bits on a California Roll. The yam tempura bits had a sweet, spicy, wasabi-like flavour and would work as a nice Asian snack. In terms of the roll itself, the creamy crab meat and avocado inside went well with the soft baked salmon on top. The roll lost the distinctive smoky flavour it once had (possibly due to being prepared by a different chef), but nonetheless remained an above-average roll. Considering the number of patrons at the restaurant, the servers did a remarkable job of being friendly and bringing out the food quickly. In fact, my dishes were brought out so quickly that my table literally looked like the Louvre Museum of food. My clumsy camera and note-taking skills just could not keep up with the pace! With its popularity, the quality of food has slightly degraded from what it was three years ago, but Sushi S still remains my favourite Japanese restaurant in South Burnaby. However, I must say that Sekai Udon Bar, with its continual attempts to improve, is slowly catching up.